When some folks catch a 9” crappie, they may consider having it mounted. 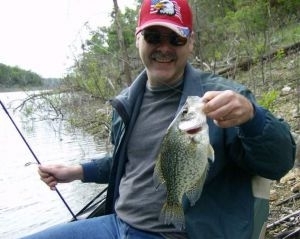 On Norfork Lake crappie must be at least 10” to be considered for the live well. That is the minimum size of a keeper. When the water temperature is right, the cloud cover good, and the planets are properly aligned, crappie fishing is incredible. You’ll be throwing that 10 incher back to make room for the more normal 12 to 14 inch fish. With a daily limit of 15, your nights may seem very long as you wait to get back on the brush piles the next morning. Where are those piles you might ask? The Norfork Lake resort owners know, as does the bait shop guys and most marina staff. Just ask, it just doesn’t get any easier. Well, actually it does because many of these folks have lake maps with known brush piles accurately marked. Now it can’t be much easier. Well….. no. The local lake managers have place marker signs mid-pile of the brush on trees and sign posts along the lake shore. Recently, all of the brush piles have been re-freshed and re-built. So with a pair of binoculars, some dollar store reading glasses, and maybe a cheap graph, you should have no problem finding the piles. But if by chance you still struggle, you might consider jugin’’ for catfish. 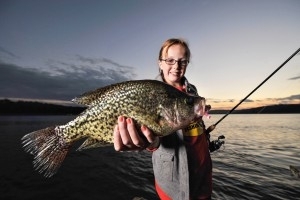 During the cooler weather, October through April, crappie fishing really picks up. They move into shallows in the many brush piles that have been added to the lake for fish cover. We find that when adding our own brush piles, the crappie move in almost immediately. 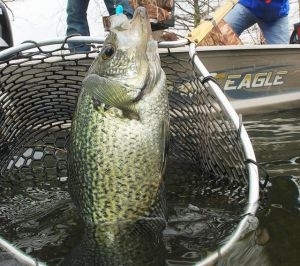 On any given day, people are surprised by the size of the crappies caught on Lake Norfork. It is common for these fish to be in the 12 to 15 inch size. You can catch them around boat docks on a regular basis in this same size range. 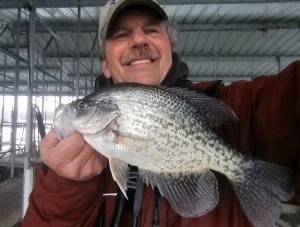 Y ou will find that perhaps you do not always catch these fish in great numbers, but you will catch the biggest crappie that most people have ever seen. 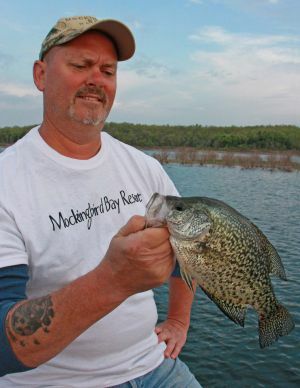 Whether you are fishing with a guide and catching larger numbers of crappie, or if you prefer to do it on your own, the size of our crappie will astonish you. Use very small tube jigs for crappie. The trick is finding how deep the crappie are. Once you find that, you can concentrate on the right color and can usually catch quite a few. Keep trying different depths and different colors, and it will not be long before you find the right combination. That jig head does not need to be too large. 1/8 ounce is good. 2 inch twister tails are good also. 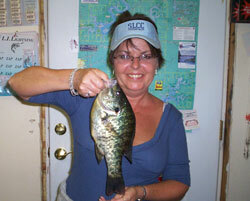 Small jigs tipped with crappie minnows are the favorite of many anglers and the fish too. If the fishing slows, move to another brush pile, and then go back later to the first and try again. Norfork water is very clear so be quiet and calm. Crappie spook easily and will not bite after a few are caught in one brush pile. By moving and fishing another pile it gives them time to settle down and return to the brush. As with other fish, the color jig varies with the weather conditions. Another basic favorite is using live minnows on a very light slip bobber. Hook one or two through the tail and drop them over the top of the pile and let them free line. Or try hooking minnows through the lips and troll them over the top and along the sides of the piles. You should get some action. to 150 feet long, and far enough out in the water so that they remain submerged during low water periods. The signs are usually about equal to mid-pile. So when planning your fall, winter, or spring fishing trips, keep Lake Norfork in mind. Walleye, crappie, bass, and striper fishing is especially good in the cooler months. The 2015 and 2017 spring rains and subsequent high water events produced a phenomenal spawn for crappie and all other Norfork Lake species. The Arkansas Game and Fish Commission predicts that starting with the 2018 season, fishing will be fantastic for years to come. 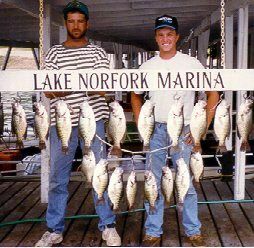 For more information on crappie fishing at Norfork Lake, check this out!